The International Monetary Fund (IMF) has raised concerns over ballooning global debt that has reached 225 percent of the world’s gross domestic product (GDP), which could lead to financial crises. “At 225 percent of world GDP, the global debt …is currently at an all-time high. Two-thirds, amounting to about $100 trillion, consists of liabilities of the private sector which can carry great risks when they reach excessive levels,” the IMF said. 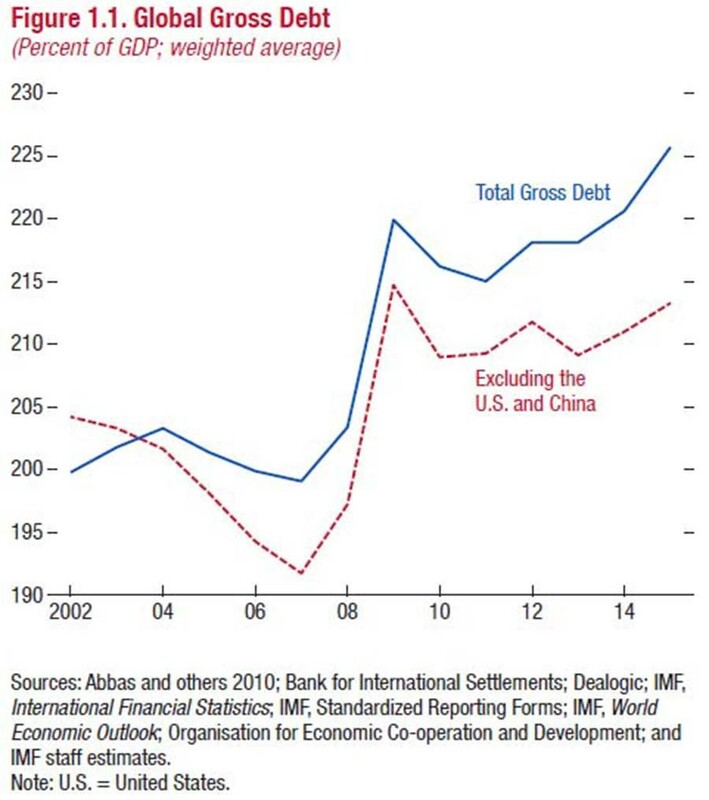 In 2002, global debt stood at 200 percent of the global GDP. “The sheer size of debt could set the stage for an unprecedented private deleveraging process that could thwart the fragile economic recovery,” said the Washington-based fund. According to the IMF, even though much of the borrowings came before the 2008 crisis, low interest rates have resulted in a surge in corporate debt in emerging markets. Levels of private debt are now high in both developed economies and a few large emerging markets such as China and Brazil, which are systemically important to global financial stability. “On average, private debt ratios in advanced economies reached a turning point in 2012, with the largest reductions since then registered in those countries that entered the crisis with high debt levels. In some cases, however, private debt has continued to accumulate at a fast pace-notably, Australia, Canada, and Singapore,” the IMF said. There’s no unanimity on what levels of debt-to-GDP should be considered as a threat to the global financial stability, the fund said. At the same time, financial crises are associated with excessive private debt in both advanced and emerging economies, it added. The IMF also concluded that high debt leads to weaker growth in the end even without a crisis. “Excessive private debt is a major headwind against the global recovery and a risk to financial stability. Financial recessions are longer and deeper than normal recessions,” IMF Fiscal Affairs Director Vitor Gaspar told a news conference.